Research showed us that many Candlelighters families travel a significant distance to access the facilities of The Square, our family support centre in Leeds city centre. In addition to this, we found that family support in the areas these families came from was lacking compared to that available in areas closer to Leeds. Here at Candlelighters, we want every family to be able to continue accessing support whilst their child is on treatment, after treatment or when the family is bereaved. Yet it can be difficult for some families to visit The Square for many reasons; cost of travel, length of journey or if a family is bereaved, they may not want to visit a place which could trigger emotions and memories. As a result of this research, we are now taking all the best bits of The Square to them - in a place close to home. The Candlelighters bus is a single decker which is separated into three rooms. Two of these areas act as treatment rooms where families can access a variety of massage treatments & reflexology. The other room is our cosy reception, complete with coffee, biscuits and lots of DVDs & toys to keep the little ones entertained. Families are welcome to take advantage of the well-being services on board or they can just bob in for a brew and natter with the team. All family members are welcome; patients, parents, grandparents, siblings, aunties, uncles...the more the merrier! Not only do we offer a fantastic range of services for our families, the team on board will also be able to use the bus as a tool to gather research from families across all areas of Yorkshire. This will help us find out how we can support them now and in the future in their local area. What does the bus offer? 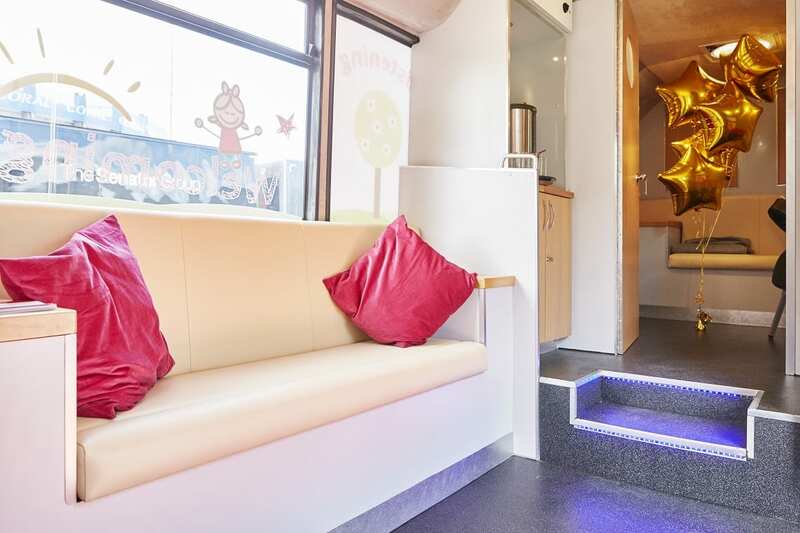 The bus will offer a range of free treatments, including all forms of massage, reflexology and energy balancing. There are lots to keep the little ones busy; colouring books, DVD, toys & games so please don't worry about bringing your little ones with you. The team on board are there to keep them entertained whilst you relax in the room next door.